Having just returned from a second trip to Portland, Maine, I feel pretty confident in sharing my own guide to the city. I’m in no way an expert on Portland, but after exploring the small peninsula that is filled to the brim with beautiful landscape, culture, and friendly people, I do feel like I have a bit of an understanding. By doing my own research prior to both trips, having friends who live in the city (hey Spencer and Mike), and from my own experience from visiting, I believe I have a good outline for any future visitors. 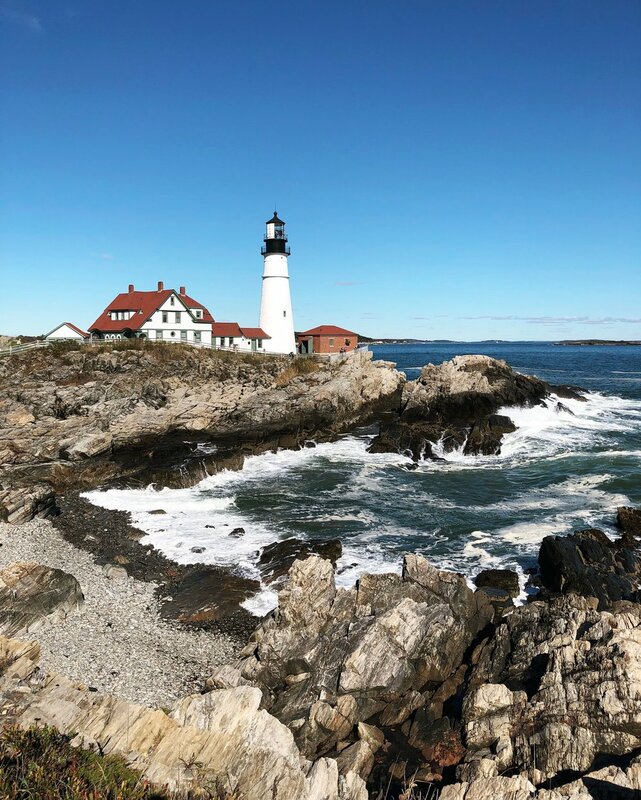 I’ve traveled quite a bit, both domestically and internationally, and I have to say that Portland, Maine is simply one of the most unforgettable and picturesque cities I‘ve visited thus far. Not overwhelming like other larger cities can be, Portland has a very open and comforting feeling to it. From the cobblestone-lined streets, to the old Victorian homes, to the beautiful water views - it all evokes a charming feeling that I don’t always get here in California. Although a smaller city, the amount of restaurants and bars and shops in Portland is staggering. And the craziest part is that these establishments aren’t just good, but are outstanding. There obviously is a reason why Portland was just named Bon Appétit’s “Restaurant City of the Year” - a feat that should not go unnoticed. So this is why my list is mostly comprised of food and bar recommendations. At home, Alex and I live *fairly* healthy-ish lifestyles, but when we’re on vacation, all bets are off and we pretty much plan our trips around what we’ll be eating and drinking. Donuts before heading to another breakfast? Sure. Grabbing cocktails at 2pm because that bar we’ve been wanting to try is around the corner? You betcha. When we’re on vacation, we want to try as much as we can and because of this, I have so many GOOD options for you. I personally prefer finding local spots to get a good sense of the community, but I definitely sprinkled in the worthy tourist-y spots in today’s guide. I want to let a couple of things be known before giving my list. Both times Alex and I visited were in October, which from my understanding, is pretty ideal. There are a good amount of tourists in town for the fall foliage, but nowhere near as many during the summer months. The weather is amazing - chilly, crisp air with either beautiful sunny or cozy, rain-filled days. Another thing I want to add is that we stayed in a hotel (the Hyatt in Old Port) both times, which we really enjoyed. Old Port is the “touristy area”, and reminds me of San Francisco’s Fisherman’s Wharf, but much more appealing in my opinion. The streets are all charming and lined with cobblestone and there are tons of really good restaurant and bar options that the locals even go to as well. Also, what we liked about Old Port is that it is essentially in the center of the peninsula. So if we wanted to go check out either the West End or Munjoy Hill/East End, it was only about a 15/20 minute walk in either direction. Walk. And I mean walk everywhere. If you’re primarily staying on the peninsula, the best way to see what the city has to offer is by using your own two feet. If that coffee shop you’ve been dying to try is about 2 miles away (about a 30 minute walk), don’t even think about taking an UBER there! Chances are, on the way to that coffee shop, you’ll come across a ton of restaurants, bars, and shops that you didn’t read about, and you’ll make a mental note to check out later. Something that wouldn’t be possible from a car. Alex and I on average walked 9 miles a day on our visits, and it was on those walks where we found our love for the city. It is also how we justified eating everything and anything in sight. The only time where Alex and I needed to take an UBER was when we visited a couple of sights south of the city (more on that below) where it would have taken hours to walk to, or if there was some pretty crazy rain. Eastern Promenade - Going off on the beauty of walking through the city, one of the best places to walk to is the Eastern Promenade, at the tip of the peninsula. It has a 2.1 mile paved trail, which boasts an incredible view of Casco Bay and the surrounding islands. It’s a beautiful and peaceful walk, and one of the first activities Alex and I did on our first trip to the city. Ferry Ride - Portland is surrounded by a number of islands that are in eyesight from the city. 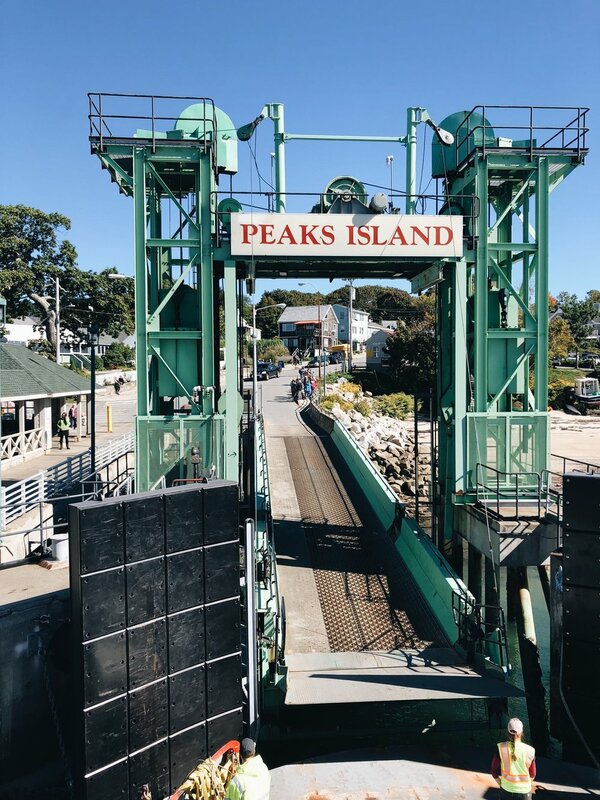 The most popular to visit of those islands is Peaks Island, which is easily reachable via ferry through Casco Bay Lines. The ride is less than a half hour, and gives you a whole different perspective of Portland as well as the other islands. Peaks is populated by a good amount of people, and there are a variety of businesses - restaurants, art galleries, museums, etc. You can either rent a bike to get around the island, but I strongly advise renting a golf cart (25 bucks for 1 hour) and cruising to Battery Steele - an abandoned/rundown WWII military fortification. Other islands to check out include Long Island or Great Diamond. Portland Head Lighthouse - This one is pretty obvious, but it would be crazy to not include Portland’s most recognizable attraction. The lighthouse is located in Fort Williams Park in Cape Elizabeth, south of the peninsula, so you’ll definitely need a car to get there - the ride is about 15/20 minutes. I think it is 100% worth seeing because it is absolutely beautiful no matter what time of the year you visit. Side notes: 1) Alex got an amazing lobster roll from the food truck/trailer that is always there, Bite Into Maine and 2) Fort Williams Park has a number of historic Battery forts to check out. Deering Oaks Park + Farmers Market - Deering Oaks is a 55-acre park that’s worth checking out especially on Wednesdays or Saturdays, when the farmers market is going on. I personally love going to the local farmers markets when I’m visiting a new city because not only do I get to feel like a local, but I get to see what the state has to offer in fresh produce. This farmers market is beautiful and plentiful, and allowed me to try some treats that I can’t wait to make for the blog soon. Portland Museum of Art - The oldest and largest collection of public art in the entire state of Maine. The museum is free to all every Friday from 4-8pm, and definitely worth checking out. Alex and I went to one of the museum’s Halloween events, a screening of Night of the Living Dead and were able to check out the rest of the museum for free afterwards. Portland Flea For All - An indoor flea market, open only Friday-Sunday, with an impeccably curated collection of vintage furniture, clothes, and everything in between. I got a couple of things the last time we went (a vintage purse and a pair of earrings) and they are some of favorite items that I own. Little Ghost - A cute thrift store where Alex got an awesome vintage sherpa-lined denim jacket. Pinecone+Chickadee - An assorted blend of vintage and new items ranging from clothes to luggage to paper goods. Folly 101 - A beautiful home goods store with its items organized in sections by color. I wanted EVERYTHING, but only walked away with a small vase and a pretty drinking glass. Blanche+Mimi - Another home goods store, beautifully presented with mostly new items as well as vintage kitchenware. I purchased a vintage Laguiole knife, as well as a wooden ice cream scoop. Dutch’s - A breakfast and lunch spot slinging some quite delicious food. Alex and I have only been for breakfast and we loved it. I read the breakfast biscuit sandwiches were popular, so Alex got the traditional one of those while I got the Scallion Stallion on their homemade bagel. We loved the food, as well as the restaurant’s decor. Also, someone gave us their cinnamon roll when they didn’t want it and since they looked like normal, nice Maine people, we happily took and ate it. I’d definitely recommend the cinnamon roll after that experience. Marcy’s Diner - Traditional diner food for breakfast and lunch, that is located in a charming, but very small, space (see picture for exterior shot). Gets very crowded on the weekend due to its size, so get there early and don’t forget to bring cash! Tandem Coffee Roasters - Converted from an old gas station, Tandem is probably the most popular place to get great coffee and AMAZING baked goods in Portland. Briana Holt, the mastermind behind the shop’s pastries, is unbelievably talented and so creative with her flavor combinations (dark chocolate and ginger scones, peach mezcal pie, kimchi and cheddar brioche, etc. etc.). We’ve tried a couple variations of the scones and cookies, but Alex and I are partial to the egg and sausage biscuits. Tandem is just the kind of place you walk into and want to try everything that is behind the glass case, and you absolutely should if you can. But get there early(!!!) because they do sell out of food and it would be a very sad thing if you weren't able to try any of Briana’s creations. Bard Coffee - A solid coffee shop with the best almond milk latte I’ve had in a while. Great pastries too. Arabica - There are two locations for this coffee shop, but we’ve only been to the one on Commercial street, since it’s so close to the Eastern Promenade trail. Our favorite thing to do was get a hot coffee before hitting the trail in the brisk mornings. Holy Donut - YES, I know this place is very touristy but I think it’s worth checking out if you’ve never tried this kind of donut before. The donuts are made with Maine potatoes, thus yielding an amazingly textured dough. Get there early if going on the weekend, if not, visiting during the week before lunch has never been a problem for us. Ohno! 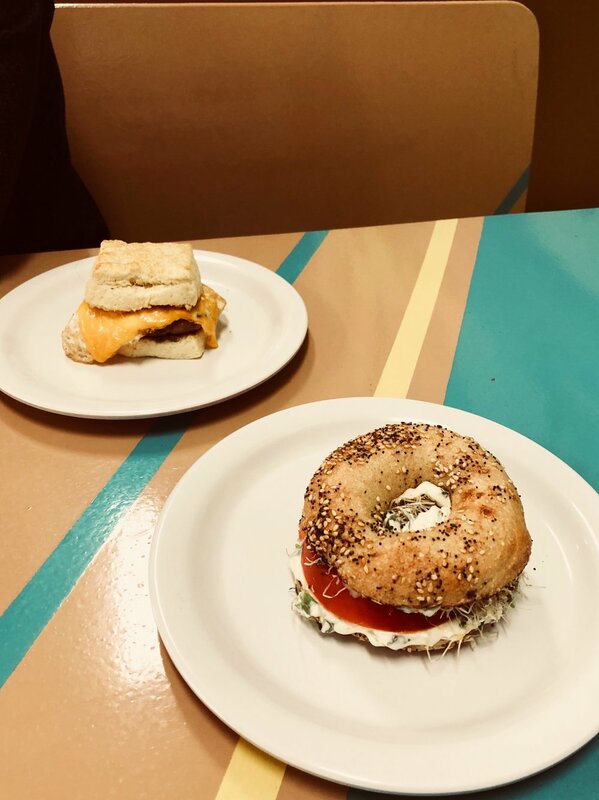 Cafe - A local spot that serves pretty incredible specialty breakfast sandwiches all day long as well as other typical lunch/dinner items like soups and sandwiches. Also can buy takeaway beer and wine. Belleville - A small, local spot with quite honestly some of the best pastries I’ve had in a long time. Their croissants are perfection and so unbelievably flaky and buttery. At lunch time, they put out Roman-style pizza which is supposed to be equally as amazing as their breakfast spread, but sadly we didn’t get to try it. Next time! Also, the Portland Observatory is across the street, if you want to see a great view of the city. New edit: they now have “pizza nights” where they open up the restaurant from 5-9pm (Thurs-Sat) and serve their amazing pizza, along with beer and wine, as well as some other food options. Standard Baking Co. - Another great spot for breakfast pastries, breads, and other sweets. Alex’s oyster selection at The Shop - he chose one of each from what was available that day. The Shop by Island Creek Oysters - I have to be fully transparent right now and tell you that I do not like seafood… all seafood. But Alex is quite the opposite, so I wanted him to eat as much seafood as he could on both trips. I read about The Shop in Bon Appétit and knew it would be a cool place to check out regardless of not being able to eat a single thing on the menu (minus the bread and butter). Alex ordered one of each of the daily selection of oysters and it came out beautifully presented. He really enjoyed his meal, while Spencer (another non-seafood person) and I watched on with a glass of wine in hand. Duckfat - A popular restaurant that is tiny, doesn’t accept reservations, and therefore has the longest wait times. Is it worth it? Totally! The restaurant is known for it’s duck-fat Belgian fries which are truly amazing. This was also the first place where I ever tried poutine and it’s safe to say that I’m a huge fan. East Ender - Located right next door to Duckfat, East Ender gets a lot of people coming in who are waiting for their table at Duckfat, although East Ender doesn’t need the help. Between both trips to Portland, Alex and I have had dinner and/or drinks at East Ender three times. The food is typical American food but done very, very well: I love the burger and Alex’s go-to is the mussels. We prefer sitting upstairs at the bar, where it’s quiet and cozy. Ruski’s Tavern - A very old dive bar (since 1892) that’s a local favorite. Serves up pretty tasty bar food all day long, but we’ve only been for dinner and it was great. Definitely a good place to get a beer and hang with friends. Sur Lie - A tapas restaurant with incredible service. We went for happy hour (which is every day they are open, Tues-Sat, 4-6pm) and ordered a bunch of items off the HH menu. The dishes are small plates which is fun and allows you to try a bunch of different items. It’s the kind of place where you'll think you’re done eating and then the person next to you is delivered an incredible dish, which you’ll promptly want to order (and you should). We loved the local cheese and meat options, the bean dip, the brussels sprouts… everything we ordered. The drinks were also stellar, thanks to Bob our bartender, who gave us amazing service. Bonobo - A super cozy pizza spot on the West End. The pizzas are made in a huge wood-fired oven, and are literally, some of the best I’ve ever had. When we went with our local friends, we ordered three pizzas, with each one having two different toppings, and it was heaven. My favorites were the Baby Arugula and Gruyere, but honestly, they were all so good. Local beer, great wine, and an inviting atmosphere. Definitely one of my favorite places to eat. The Snug - This bar was on my wishlist to visit and I couldn’t be more in love with it. 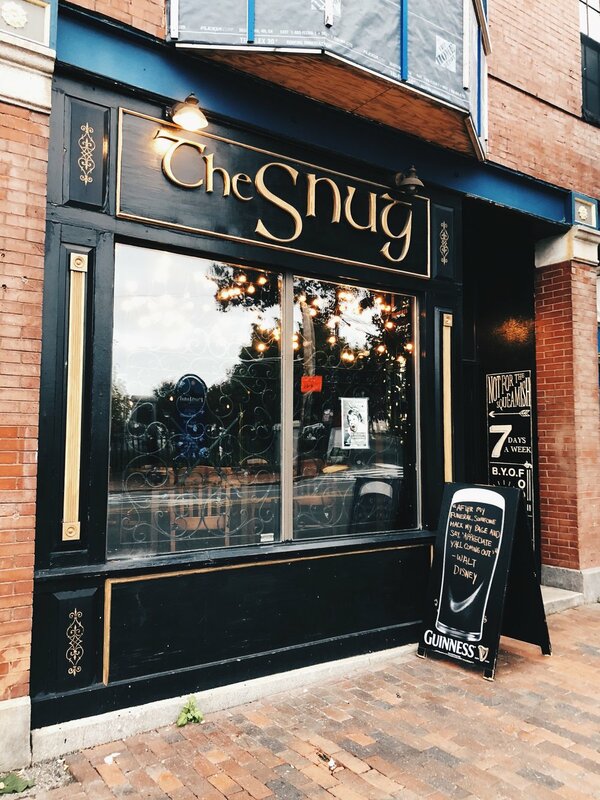 Located across the street from the very old, yet beautiful Eastern Cemetery, The Snug is a dark and cozy bar where I could see myself finding refuge during a cold winter night. I got a hot toddy when I was there and it was absolutely perfect when seated in the private booth. Maps - A small and comfy beer and wine bar adorned with vintage maps and vinyl records that the owner has been collecting over the years. They also serve grilled cheese sandwiches and homemade cake; it’s perfect. Our bartender was super nice to us when we went which made the experience that much more enjoyable. Top of the East - A lounge located at the top of the Westin hotel that gives you a beautiful view of the whole city. Try to get a table at the window for the full effect. Arcadia - A barcade (a bar with arcade games) is pretty much Alex’s dream place. We always love checking out barcades (Blipsy in Koreatown is our LA fav), but I think Arcadia is best. They have really good and reasonably priced cocktails and local beer on tap, an amazing collection of classic games, and friendly staff. It’s a super laidback environment and we love being there. Tomaso’s Canteen - A great little bar with a drink special where you can get a Bud Light and a Jell-o shot for $5.50. Enough said. Portland Hunt and Alpine Club - A higher end cocktail bar where you can get fancy drinks, but are worth the price for how good they are. Alex and I stopped in for a drink before heading to dinner one night, and were very pleased with our cocktails of choice. I loved the atmosphere and can’t wait to go again to try more of their creative drinks. LFK - Probably my favorite bar in Portland. Located in Longfellow Square, LFK kind of has the appearance of a funky coffee shop with it’s eclectic furniture and decor. The cocktails are incredible, the vibe is very laidback, and the food is supposed to be good too (didn’t have the chance to try it). This is the kind of bar where I could hang out every Friday night and never get sick of it. Local 188 - Also located in Longfellow Square, Local 188 is a tapas restaurant, but we only ever went for the drinks, which were always amazing. The drinks menu is very impressive and the service was great. Bramhall Pub -Bramhall is a speakeasy in a basement that we visited on our last night in Portland, and I’m so glad we did. The bar kind of looks like a dungeon with its brick walls, dim lighting, and candles lit everywhere. Great drinks and a very cozy atmosphere. Vena’s Fizz House - The front of this place is a store where you can buy vintage glass and barware, as well as housemade bitters and sodas. And in the back of the store, there’s a small bar where you can get some stellar cocktails. I left the shop very happy and with a couple of vintage glasses to take home (including the red ones in the picture above). Little Giant, Chaval, Drifters Wife, Central Provisions, Rose Foods, Fore Street, Palace Diner (located in Biddeford, Maine), The Honey Paw, Eventide Oyster Co., Cong Tu Bot, Bayside American Cafe, Ten Ten Pie, Hugo’s, Miyake, and any of the breweries in the area (Allagash, Rising Tide, Owbox, Austin Street, Bissell Brothers, etc.). I’m probably missing a few… I wasn’t joking when I said that Portland has phenomenal food! I hope I did Portland justice with my city guide and moreover, I hope I’ve persuaded you to maybe take a trip there in the future. You won’t regret it.